1. Turn your tee inside out & wash in COLD WATER on a Delicate Cycle. 2. Air/Hang dry or dry on a Ultra Delicate Cycle. 3. 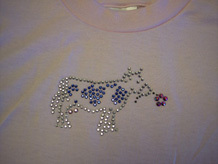 For items with a LARGE amount of rhinestones, we recommend that you HANDWASH in COLD WATER & AIR DRY. 4. Iron on MEDIUM heat, inside out. **As part of our terms and conditions, these care instructions MUST be followed for item returns based on our return policy. STEP 2 Lay your fabric, leather or other material on a flat, hard surface with the design surface facing up. STEP 3 Run the iron gently over the top of the fabric, leather or other material to slightly pre-heat it. 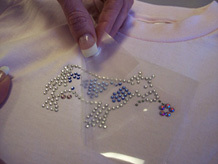 STEP 4 Remove the backing from the rhinestone applique and lay the entire transfer design on your material. The warmed fabric/material helps slightly melt the adhesive on the back of the transfer to keep it in place. STEP 5 Place a thin piece of cotton cloth--for example, a piece of white t-shirt material--gently across the top of the rhinestones and lightly set your iron on top of the cloth at the outermost edge or corner of your design. 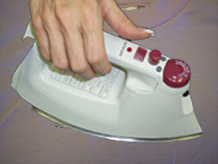 This creates an even heating surface and protects both the iron-on transfer and the soleplate of your iron. STEP 8 Allow to cool to touch then slowly peel off transfer film. If any rhinestones are still on the film, cut away film where rhinestones are secure and replace just the area of film where the stones did hot adhere - repress for 5 to 8 seconds. 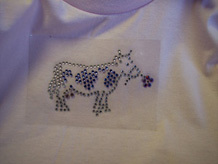 STEP 9 You can now wear and enjoy your completed transfer motif. To wash, turn garment inside out and wash on gentle cycle or dry clean. **DISCLAIMER: Leather, polyamide, PVC, rubber, plastic, fabrics with silicone or wax finish are not recommended. Since application methods and fabrics / products vary, Shootie Girl is not responsible for any damage in relationship to wear or application of transfers or trims. Always ensure to perform the application with care on high quality fabrics and materials.